Yesterday I finally finished my piece on Toronto, this is the big piece I’ve been talking about since November. It has taken way longer then I anticipated, partially because of the holidays and also because it is a big piece and it just took some more time to finish it. I’ve been working on it nonstop for the past two days and it has made me so very happy! That’s not unusual, I am often happy when I finish a piece but this piece has been special. Somehow it felt right and I’ve has so much fun working on it. It came out exactly like I had in mind, or maybe I’m phrasing that wrong. The piece has the exact feel that I was going for. Yeah, that’s a better description. Most of the time when I start I piece, I will have a clear idea about where it needs to go. For this piece that Idea was particularly strong. Now I’ve had strong ideas before and most of the time it doesn’t work out for many different reasons. But this piece just fell into place, like it just had to be. Working on a big canvas has been great as well, it just feels different when you have a nice big space to work with. It did bring it’s own unique challenges but they were relatively easy to overcome. I will definitely be doing more big pieces in the future. 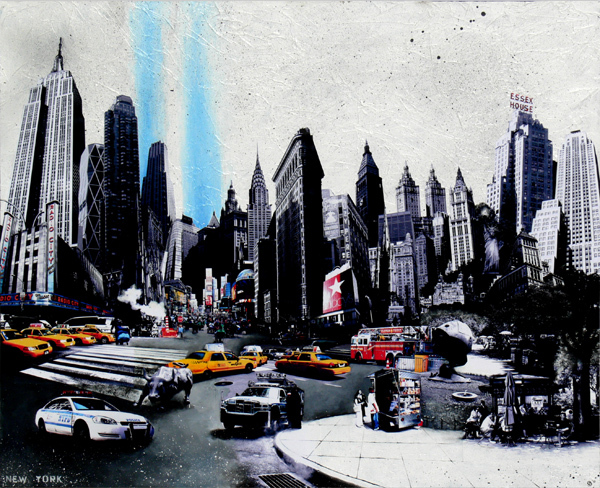 That being said, I’m now going to work on my abstract piece and then I’ll be working on my yellow cab series. Both will be on small surfaces but that’s good, it gives me some time to consider my next big project before jumping in. 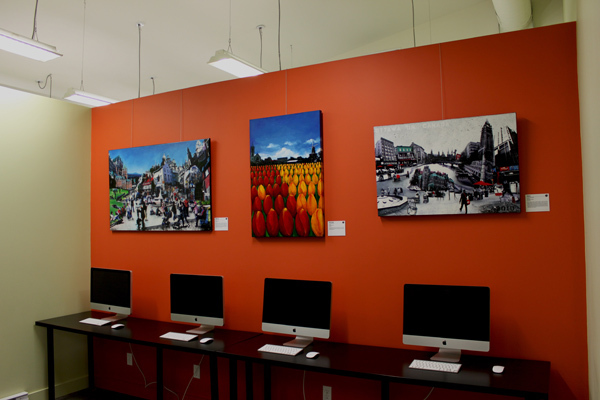 A couple of my pieces will be decorating the walls of the Culture & Language Connections Language School located in Montreal. I will be putting them up tonight and they will be up until April 5th. Culture & Language Connections is a unique private educational language institute. They offer a range of personalized programs that focus on communication and conversation and specialize in building confidence for natural interaction in your language of study. The currently offer English, French, Japanese and Spanish courses and immersion programs. Check out their website for more information: www.clconnexions.com. Being an artist can be like swimming against a strong current, it's hard work.Not only are you constantly battling your own insecurities and creative ups and downs. But at the same time you have to keep convincing the world around you that you are an artist and that this is your job. Being able to do what you love every day is a blessing, and I feel very fortunate to be able to do this. But that doesn't mean that it's always fun. Somehow people seem to have a hard time taking you seriously when you're an artist. Most of them will think you're just playing around with your hobby doing a bit of crafts. They don't understand that you have to show up at your easel every day and that skipping a day feels like a horrible crime. I get really cranky if I don't get enough time to paint during my week, it makes me feel stressed and I'm no fun to be around. The fact that I'm still starting out as an artist and haven't sold a lot of pieces kind of adds to this view people often have. On a daily basis I not only have to convince myself that I'm good enough but I also have to convince the world around me that I'm not just playing around and that I'm really serious about making it as an artist. And then I haven't even touched on the difficulty of getting recognition from the professional art world. That's a whole beast in and of its self, a lot has already been written about that and I don't have the illusion that I could add something new to that. Now I have to admit that I have a few precious people around me that not only support my decision on being an artist but encourage it as well and I am so very grateful for having them. I am a professional artist and I'm proud of it! I have three paintings waiting to be finished. All three have been sorted, copied and gelled and the gel of at least one of them is dry enough to work with. But instead of spending the day in my studio I've been sitting behind my computer struggling with this press release. Unfortunately being an artist isn't just about painting and creating work, it should be, but it isn't. At least not when you're just starting out and don't have the money to hire a PR person or have an agent. A lot of the time it's about promotion which isn't something I have a whole lot of knowledge about. I mean, off course you could just lock yourself in your studio and just paint but that would be a bit pointless because I create my work to be seen by other people. The problem with that is that people will need to know about it first and that's where the whole PR thing comes in. I find it quite hard to find a balance, especially now, when I'm preparing for my solo show in April. this should ideally be a time to create a lot of work for the show. But this PR stuff keeps cropping up and getting in the way. Now I know that this is probably more so now because this is my first solo show and all these things take a lot more time doing them the first time. I have to admit that I'm very, very lucky. I have several very intelligent and professional people who are helping me out with this, reading over my material and giving me tips and tricks and I'm very grateful for that. But sometimes I wish I could just be an artist and paint without worrying about the PR part of it all. Six empty wood panels and 198 possible pictures to use, you would think I’d be more then ready to start my Yellow Cab project. Instead I’ve spend the morning cleaning up my desktop, to be fair, this was desperately needed so not a total waste of time but not what I intended to do with my day. This week was supposed to be devoted to my Yellow Cab project but this project is turning out to be way more challenging then I thought it would be Partially because it has multiple panels and partially because I’ve got it into my head that I want to do something a bit more abstract. I don’t want to be making street views using the cabs as elements, I want something different and therein lies the challenge. Another problem with this project is that I use this acrylic gel transfer technique which forces me to a pretty long waiting period between the printing and sorting of the elements and the actual construction of the piece. And because I want to do something a bit more abstract I want to use the transparency of the acrylic gel pieces. Problem is that that transparency only becomes apparent after about a week time and a whole lot of work. So while I can sort through my pictures and combine them in my head, I can’t actually see how it will look until I’ve printed, copied and gelled the pieces, waited for a week for the gel to dry, removed the paper and let them dry again. So now I’m frustrated, I have many pictures I want to use, but because I have multiple panels I’m afraid I will use either to many or too few per panel. And I have too many different ideas in my head fighting to make it into this series. I’m also frustrated with the title of my series, maybe I should rename it and not only use yellow cabs, I’ve got tons of great pictures of subway stations and street scenes, police cars and fire trucks. But then I’d only give myself more pictures to work with, which would only increase my frustration. Then again, if I don’t, this little voice in the back of my mind, will keep nattering on about those other great pictures I could be using. Now to be fair, I’ve already got one panel sorted, sort of, I think. The prints are at the copy place right now, so maybe it would be wise to wait for those and see where this first panel will take me. That might make it easier to start on the other ones. I do have one other little canvas waiting for this other abstract idea I had a while back. This way I’ll take the pressure off this project, play it safe by finishing one panel before working on the next one and I’ll still stay within this more abstract frame of mind that I want to be working in. Yes, I think I’ve found the solution, I’ll start work on this other project instead. See, I’m not procrastinating when I write this blog, I’m making up my mind! New York on display in New Jersey! 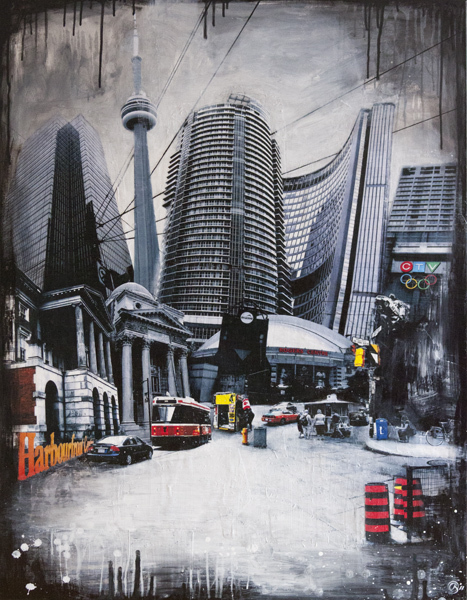 This past week has been spent mostly on finishing the first stages of Toronto. This is going to be a bigger piece so it involved puzzling multiple prints into single buildings, something I haven' actually done before. I'm eager to see how it's going to turn out. I've had a lot of fun with the first stages of this piece and I'm looking forward to finishing it. All the elements are being copied at the moment so next week I'll be putting the gel on. In the mean time I'm busy prepping my 6 wood panels for my little series of yellow cabs that I've planned on staring. I'll be starting work on that while the 'Toronto' pieces are drying. I'm really looking forward to that. The plan is to make six pieces with yellow cabs as the main subject. I want to try and do something a little more abstract so we'll have to see how that is going to turn out. For now it;'s back to the Gesso though, I've at least two more layers to go before I can use those wood panels. Happy 2011 art lovers! My holiday break is now officially over, all my visitors have left and the house is back to normal, time to get back into the studio and create some awesome new peaces! Just before the start of the holidays I started on my piece of Toronto. This is going to be a bigger piece and I've decided to use some bigger pictures for this one. A bit of an experiment because this means that I will have to build the building from several prints. The good thing is that I've already made my start so it should be relatively easy to get back into it. I'm really looking forward to my next project as well. I've purchased a nice bunch of small wood panels for a series on New York Yellow Cabs. I've visited New York twice in December and I took a nice bunch of pictures while I was there. I wanted to make a series of smaller works for my show in April and these wood panels are perfect. I will have to prep them before I can really start working with them but that shouldn't be a problem. This will be the first time that I'll be working on wood so that's going to be exciting and new. I'm thinking of making these smaller pieces a little more abstract but that still all in my head so who knows where we'll end up on this one. I also still have this idea for an abstract work on Chicago that's still buzzing in the back of my mind. Loads of new exciting stuff in my head, a great way to start 2011! Let's go and finish Toronto!